Located on the south facing, grassy plateau of a mountain range, Alpe d’Huez resort earns its name ‘Island in the Sun’ due to long periods of sunshine and an active micro climate. 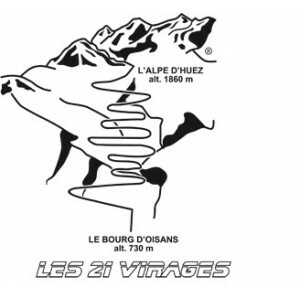 Alpe d’Huez has been developing as a resort since 1936. At 1860m altitude in the Grandes Rousses Massif, the resort culminates with the ‘Pic Blanc’ whose summit at 3330m gives incredible panoramas of the Ecrins National Park and its famous peaks, the Rateau, the Meije, the Muzelle, the Aiguilles d’Arves, the Belledonne and Mont Blanc, a panorama classified with 3 Michelin stars. Rich in numerous sporting activities (hiking, airborne sports, cycling, horse riding, …) as well as cultural activities and relaxation, Alpe d’Huez is also the setting for many exciting events throughout summer! The height gain of the climb is 1120m. The climb is 13.8km long at an average gradient of 7.9%. 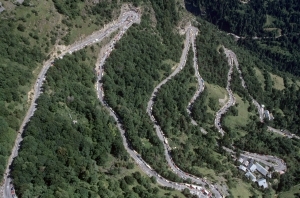 The climb comprises 21 hairpins numbered in descending order and marked by panels on each bend (formerly these panels served as visual aids for snowplough drivers!). At each hairpin the road plateaus a little allowing a short break from the gradients separating the bends which fluctuate between 8-9%. The climb starts 600m after the roundabout with the RD 1091 (ex-RN 91) just outside of Bourg d’Oisans. As soon as spring arrives, cycling becomes the defining activity of the Oisans. World renowned events take place all summer long. The topography of the Oisans offers road riders all the cycling challenge they need! Mountain bikers can discover some dizzying heights, bike parks and wild trails. 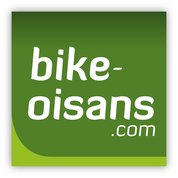 Electric bikes can be the perfect ‘champions’ assistant’ to the beautiful rides in the Oisans! 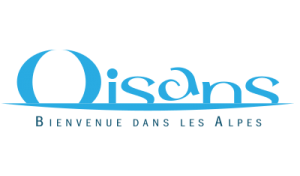 The capital of the Oisans, Bourg d’Oisans is proud of its grandiose surroundings and spectacular geological folds and cliffs, making this one of the most important and fascinating regions to interpret the very creation of the Alps. A green and peaceful haven in the middle of majestic mountains, Bourg d’Oisans has the charm and conviviality of a small town combined with the beauty and spectacle of high mountain peaks. On your doorstep, the wild reserve of the ‘Ecrins National Park’, the highest and largest of eight national parks. Bourg d’Oisans « green holiday resort and snow village » is an open door to mountain culture and immense natural heritage. Whether you’re a weekend hiker, extreme sports fan or family holiday maker, Bourg d’Oisans offers a rich and varied palette to satisfy all.